Asbestos was common in building materials between 1920 and 1986.Asbestos was common in decorative plaster between the 1940s and 1980s and in the artex ceilings that were popular in the 1960s and 1970s. The date a building was built is often the most important clue to whether or not it contains asbestos. Asbestos fibers only become dangerous when they are airborne because the materials that contain them are damaged. This can happen when plaster deteriorates or is disturbed. 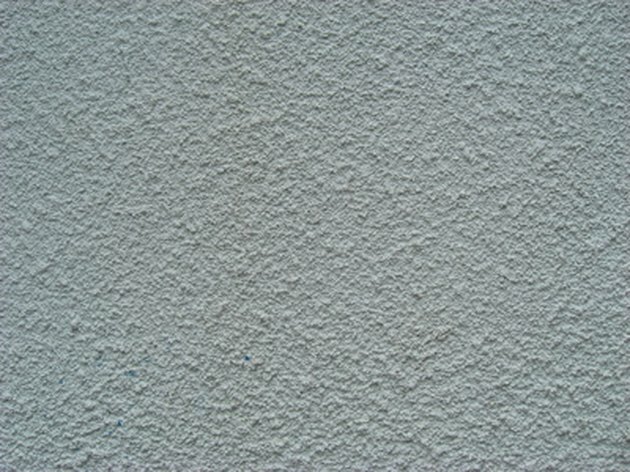 The "popcorn style" or "artex" ceiling popular in the 1960s and 1970s may contain asbestos. Obtain the date of your building's construction. If you do not already know this date, ask your landlord for the information. If you own your building, this information should have been given to you at the time of purchase. If your building was constructed between the 1940s and the 1980s it may contain asbestos in the plaster. Look for damaged or crumbling plaster. If plaster containing asbestos is damaged it may release asbestos into the air. This is dangerous to human health. Examine the texture of your plaster. If it has a fluffy "popcorn" style texture, it is more likely to contain asbestos. Examine the style of your building. If the building has art deco style work, this may contain asbestos. Call an asbestos control expert if you believe your plaster may contain asbestos. Asbestos control experts are trained to identify asbestos in building materials and can safely take a sample to be tested.